What’s the Difference Between All the Dairy-Free Milk Alternatives? Walk down the dairy aisle of just about any grocery store, and you’re sure to find a number of non-dairy competitors vying for your attention. Even if you’re not vegan or lactose intolerant, you can still improve your health by switching to non-dairy alternatives like soy, rice, almond, hemp, oat, or coconut milk. Don’t believe us? We asked nutritionists to break down the benefits of the most popular kinds of non-dairy milk below. “If you’re [looking for] a product that contains no saturated fat or cholesterol while delivering a creamy, nutty, taste, then look no further than almond milk,” says Jayson Calton, a certified nutritionist. 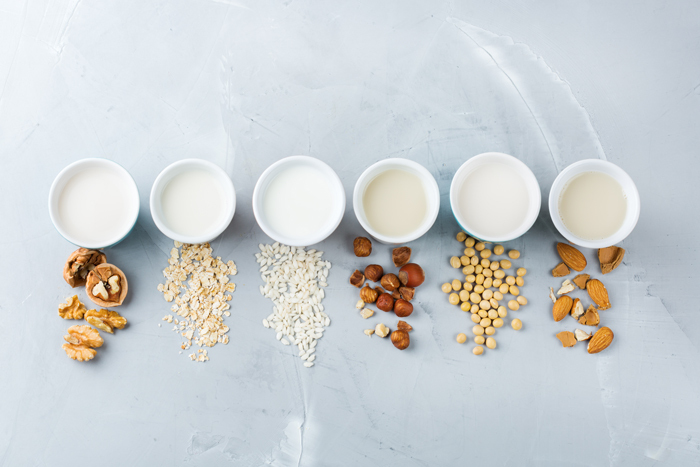 While low in protein compared to other non-dairy alternatives like soy, almond milk is low in calories and contains a ton of nutrients including selenium, manganese, potassium, iron, calcium, vitamin E, and omega-6. Do you ever wonder if beauty supplements work? Here’s what a few doctors had to say about this wellness trend. Stephanie Taylor, who affectionately goes by Stevie, is a quirky twenty-something nomad in the process of figuring it out. A Los Angeles-based writer, Stevie is originally from Michigan and has lived in five states and traveled to 29 (a list she is in the process of growing). When she's not writing, she enjoys traveling, working out, and listening to new music. If she wasn't a writer, then she'd probably be a lawyer, music manager, or girl band member. What about Cashew Milk? Or Macadamia Milk? I am intolerant to all dairy so I have been using Almond milk & Coconut Milk for the past two years. Trader Joe’s has a great Almond Milk. You forgot Ripple / pea milk! 8 grams protein. Delicious! I have just jumped on the Oat Milk train, and learned that the above rings true! So far my favorite brand is Elmhurst Milked Oats (I get mine at Publix). I do not like (AT ALL) the Quaker Oats Drink. It is just well, imo gooey and not at all tasty. Even used just as an addition to my coffee, still a no go.